At BFS, we’ve always taken our sausages very seriously. Traditionally, apart from black and white (hogs) puddings and saveloys, us Brits have stopped at the breakfast sausage and culinary creations haven’t got much further. There’s nothing wrong with ‘toad in the hole’ but elsewhere they’re many steps ahead of us with all manner of smoked (or partially dried) sausages for poaching, casseroles etc. We’ve been making our cooking chorizo for years. 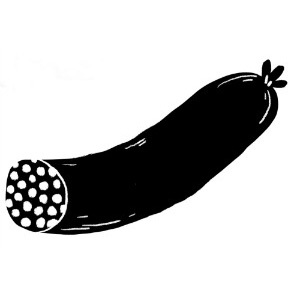 A couple of years ago we added a smoked Montbeliard style sausage and, together with our black pudding, French Country and Italian (with fennel seed) they make up a pretty good selection. I wouldn’t like to say who was the first to pair sausages with beans – it certainly wasn’t that well known gourmand, famous for his fifty seven varieties of pickles. Cassoulet and Fabada Asturiana have been around for centuries and across the wide sea, baked beans became Boston with the addition of a little molasses or treacle (leftover from distilling rum) but no one can deny that the addition of a sausage or two (however bad they might be) works – even in a tin. So at the end of the winter, when the veg run out, dried pulses come to the fore. This year we don’t have to go all continental because, for the first time in the shops, we have Hodmedod’s UK grown pulses. Their ‘signature’ fava beans are a little smaller than you might expect, but that makes them all the better as a substitute for haricot, cannelloni and kidney beans. There are loads of sausage and beans recipes out there. Cassoulet, Fabada Asturiana and Feijoada are famous all over the world so we’re not going to attempt to reinvent the wheel – although we have done already with the Fabada. There were a couple of promising recipes in the paper last week including Margot Henderson’s Fennel Sausages with tomato sauce and Nigel Slater’s sausage and beans in the hole. It’s a combo that just keeps giving, sometimes in the most unexpected ways – Marcella Hazan’s Sausage and Borlotti bean risotto was a surprise success, especially when made even more ‘earthy’ by substituting the rice with pearl barley. Brown the sausages on a reasonably high heat. Rinse the fava beans and bring to the boil in about half a litre of cold water. Cook until al dente. Drain – keeping a little liquid. Heat a little oil in a heavy casserole and sauté the diced onion, carrots, celery, bay leaves, thyme, garlic and bacon until nicely browned. Add the browned sausages, beans, tomatoes, stock, quartered onions, bean paste and mustard. Season with black pepper – it shouldn’t need any salt. Bake for an hour and a half at 160°C with lid on and another forty minutes without the lid. Keep an eye on it and push the top down if it gets too crusty and add the bean liquid if it gets too dry. soured cream or Greek, chopped chives, thinly sliced onion. Halve, peel and chop the onion and garlic. Fry the chorizo, onion and garlic in a heavy-bottomed pan to release the fat. Cook, stirring often, for about 10 min until the onions are sloppy. Spoon out onto a plate. Cut the sausages into 3 or 4 pieces and brown in the pan. Add the cumin and chilli and stir around until it begins smelling fragrant. Add the wine. Stir well, scraping up any crusty bits, letting the wine reduce by half. Add oregano, tomatoes, stock and cooked chorizo and onions. Stir well. Simmer, uncovered, for 20 min or until the sauce is thick and sausages cooked through. Taste and adjust the seasoning with salt, pepper and lime juice. Drain and rinse the beans and add to the pan. Heat through now or later. Serve with the usual suspects. In the Emilia-Romaaga region of Italy, lentils and cotechino sausage are a traditional New Years Day celebration. Smoked Montbeliard sausages are from the Savoy region of the Alps and work even better. Peel and dice the vegetables medium fine. Sauté in a medium casserole in the oil. Season and add the lentils, stock, water, bay leaves and thyme. Bring to a simmer and cook for 30-40 minutes until the lentils are tender. Top up with water if it looks a bit dry. Add the sausages whole to the pot and allow them to poach for fifteen minutes. Fish out and cool under a cold tap. Cut the skin lengthways and peel off. Finely dice two of the sausages and return to the pot. Slice the other two sausages on the bias approx ½ cm thick and fry in a dry pan until nicely charred on both sides. When the lentils are done, discard the herbs, arrange the slices of sausage on top of the lentils and serve – with mustard of course. If a lentil and sausage soup is more to your liking, add more stock or water when you’re cooking the lentils. A few more vegetables (kale or cavalo nero for example) will also add to the mix. An absolute classic – it’s pretty good when you fry some chorizo, add a tin each of chickpeas and tomatoes and give it a stir as it heats up. Or you can do it properly. Quickly fry the sliced chorizo over a high heat until it’s nicely charred on both sides. Set aside. Heat a couple of tbsps of olive oil in a heavy saucepan and sauté the onion, carrot, parsley stalks and celery, bacon and chopped chorizo until the whole mix begins to brown, adding the garlic at the end just to soften it a bit. Add the wine, tomatoes and approximately a can full of water, stir and bring to the simmer. Add the chickpeas, stir, season well with black pepper and simmer for another ten minutes. Serve with a poached egg on top.